May 28 - Time Trials & Isottas! May 26 - Burman Fastest of the Month! May 22 - Where is Isotta? May 19 - 10,000 Fans! These articles report the tragic story of the death of Stutz team riding mechanic Harry Martin almost a month after his amazing feat in the closing laps of the 1913 Indianapolis 500. As riding mechanic for driver Charlie Merz, Martin batted at flames, feeding on the inevitable splathering oil of the early cars, that had sprung up from under his engine cowling. Martin removed his jacket and beat back the fire as he and Merz bravely pressed on to the amazment and consternation of 90,000 fans and their crew in the pits. The man behind one of the great legendary stories of the most historic race in the world met his maker on July 26, 1913. Two of the articles were published in the July 27 Indianapolis Star (designated with "Star" in the attachment name) and the other - unfortunately in poor condition - ran in the July 26 Indianapolis News. At risk of stating the obvious the Star was the morning paper and the News was distributed in the afternoon. As a result the News was able to run same-day stories provided they occurred prior to their early afternoon deadline. This also created more opportunities for errors as stories were rushed into ink. This accounts for a discrepency in the two stories. The News reported that Martin was driving the car and the Star - the one I believe to be correct - reported that he was riding in the mechanic's seat. The driver was Frank Agan who was gravely injured and came out of surgery with doctors wringing their hands over his survival. An Internet search suggests that Mr. Agan did survive and finally passed away in 1961. Stutz management criticized Agan - called a test driver - for ignoring their signals to slow down resulting in the accident. Who knows if there was concern about legal issues. One other point. 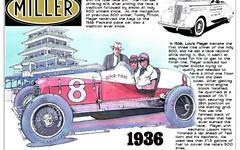 The articles indicate that Martin was the riding mechanic for 1912 Indianapolis 500 winner Joe Dawson in that race.